A Ferrari, 10 properties and five Rolex watches are some items former Fifa vice-president Jeffrey Webb has provided to secure his release on bail. Webb, 50, has pleaded not guilty to corruption charges connected with world football's governing body. He is under house arrest in New York after securing the $10m (£6.4m) bail. Among the items Webb put up as bond were 11 luxury watches - including a Cartier Roadster - three cars and his wife's diamond wedding ring. According to an order filed on Monday setting the conditions for his release, the vehicles were a 2015 Ferrari, a 2014 Range Rover and a 2003 Mercedes-Benz. Webb, from the Cayman Islands, also provided a $400,000 (£256,000) account in the name of his wife, Dr Kendra Gamble-Webb. He is accused of accepting bribes worth millions of dollars in connection with the sale of marketing rights and was detained in Switzerland in May, along with six football officials. 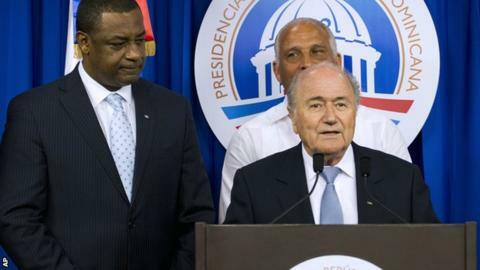 On Monday, Fifa announced a programme of reforms to address accusations of corruption within the organisation.